Fresh from their success this afternoon against Alfreton Town, the Bulls next travel to Guiseley in the Vanarama National League North in a weeks time. Our Talking Bull ‘Ground Guide Guru’ Simon Wright brings us his take on our upcoming opponents, and provides some background for the Hereford supporters who will be making the trip next Saturday. We’re Off to Yorkshire to play our 20th different League opponent this season. As far as I can remember, don’t think we’ve ever played them before? The Tykes were founded back in 1909 and up to quite recently were a small Step 5 or 6 club who occasionally had a run in the FA Vase. They only installed floodlights in 1988. A year later, they reached the FA Vase Semi Final. In 1990, they won the FA Vase in a replay and got to the Final again in 1991 but lost 5-3. All that success was a platform for a stately rise through the Leagues and they reached Step 2 for the first time in 2010. Once there, they reached the Play-Offs 5 times in a row. I saw them lose two Play-Off Finals and win one Semi-Final. They finally went up to Step One in 2015. Our hosts were relegated from the National League after two years of struggle. In their relegation year James Roberts played ten games and James Wesolowski six times. Not that we are blaming either of them for the relegation, I hasten to add. Guiseley are a small club in a small town without a benefactor and found the going hard. A brief experimental switch to full-time wasn’t successful in Step 1 and was quickly abandoned. Cue mass exodus of 18 players in the summer. So should you feel the urge to read up on Guiseley’s squad, expect to see signed in June or July or August 2018. There are some familiar names such as Kingsley James, one of the unpaid players who we all thought kept Hereford in the Conference. Judging by his squad picture, he still sports a considerable amount of facial hair. Up front is Kayode Odejayi – ex Forest Green, ex Cheltenham etc. Big, big bloke 36 years old, nearly 700 games and still a first team regular. Our defenders had better take their own step ladder with them. The club have joint managers, Brummie Marcus Bignot who did great things with Solihull. He is a Bluenose and is married to the Arsenal Ladies goalkeeper. His partner is Russ O’Neill who was assistant manager at Alfreton for a decade. As well as being in the FA Trophy with a replay 3 days after our visit, Guiseley are still in the FA Cup. Just five days before our visit, they have a live FA Cup Round 2 game against Fleetwood. As an aside, this is Fleetwood’s fourth different Non-League opponent in just two seasons and the fourth time they’ve been chosen for live Tv games. Must be coining it in. Anyway, with so many Cup matches, Guiseley’s League form has slipped a bit. They lost at home to Blyth recently, only their second home defeat, and I do wonder whether we can cash in on that. Their home record is won 3, drawn 4 and lost 2. The other defeat was by Chorley. If you’ve wondering about their geography, Guiseley is a rather smart distant suburb of Leeds with a population of 22,000. Its best known as the home of the original Harry Ramsdens restaurant and the birthplace of Harry Corbett. Remember Sooty and Sweep? Nethermoor Park is similar to Brackley, being rather basic and rather open. Ideal for December. The 500 seats are located along one touchline, split between two small modern stands. Opposite a small covered terrace, which again is located towards the Railway End. Both ends are open. The home side average 720 so there will be lots of room. Segregation is rarely enforced and given our small numbers, I hope we’ll not be stuck in the corner like naughty schoolchildren. Expect to pay adults £13, concessions £9, Under18’s £5, Under 11’s £1. There is no parking at the ground for us, but there is a free car park extremely close on Netherfield Road LS20 9PD. Access Nethermoor by the footbridge in the back corner. Otherwise street parking but dire warning about ardent patrolling street wardens. 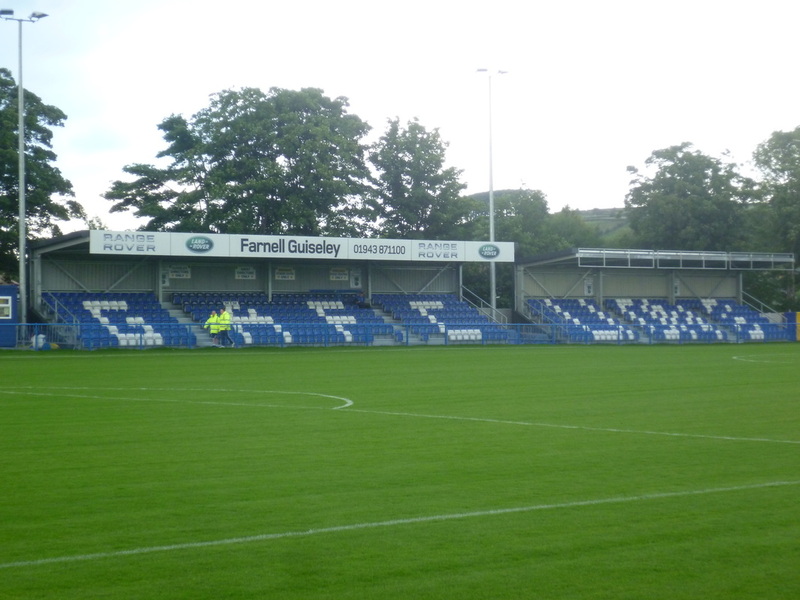 If any Disabulls travel, Guiseley offer designated parking, wheelchair spaces in the main stand, accessible stands and free entry for carers/ assistants. Credit to them – if you contact the club, they reply within the day. The Clubhouse is situated within the ground and promise “lots of real ale”. The building is shared with the Cricket club . The nearest alternative is a ten-minute walk from the ground along Otley Road (towards centre of Guiseley) is Coopers. This CAMRA pub has eight real ales on tap. These will include a Timothy Taylor’s, a Roosters and an Okell’s beer as well as a real cider and a dark beer are always available with 5 guest beers. Coopers is handy for the station. About ten minutes’ walk is a Morrisons supermarket with a handpump in their café area, serving Saltaire Blonde, plus Italian wine and bottled beers and lagers. This is the only UK Morrisons to offer this facility. A couple of places for the hungry. Firstly, head in the town centre along Otley Road for the Station restaurant. This is a bar with excellent pizza, according to Tripadvisor. As the name suggests, very handy for the station. Alternatively, head in the opposite direction along Otley Road to the Wetherby Whaler. This establishment was the original Harry Ramsdens before it was sold. Tripadvisor rates it as the second-best restaurant in the town. Unlike Ramsdens, the Whaler has an extensive veggie menu. Not cheap and Christmas may mean table shortages. By Train: 5 hours each way from the shire, changing at New St and Leeds is a nuisance. Ground is handily five minutes’ flat walk from Guiseley station. For anyone travelling from elsewhere just get To Leeds and there are lots of local trains to Guiseley. If your train manager is called Al, remember me to him. By Plane: Leeds/ Bradford airport is nearby. Why mess about with trains?